THE SCENE: It was, dare I say, pleasant this morn’. Mid-70’s, not too humid. Good break from the past couple weeks. F3 WELCOME & DISCLAIMER: Successfully given. Starting in Corner 1 (Northwest corner of end zone), burpees x5 OYO, bear crawl across to Corner 2, Squat x5 IC, mosey ~120 yd to Corner 3 (far Southeast corner of opposite end zone), Merkins x5 IC, backwards yog across to Corner 4, flutter kicks x5 IC, sprint back to Corner 1. Indian run half-way back to startex. Stopped and did a bunch of big boy sit-ups while waiting on the six. Mosey back to startex. Wall sit around the banana stand. 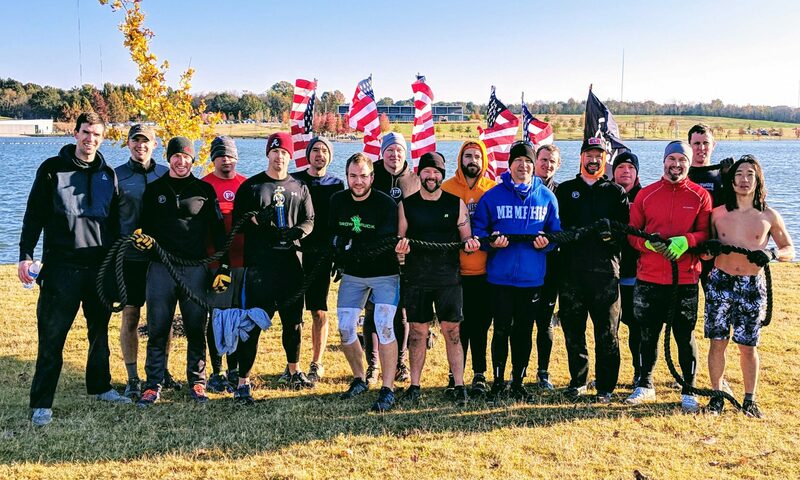 Half of the PAX did 15 dips while the other half held wall sit. Flapjack until each group did 3 sets of 15 dips. Lunge walk back to flag was interrupted by Father Time. 0615. Prayers for a couple PAX who haven’t been around in a while and for a couple more who are injured. T-CLAPS to all the PAX today for sticking with it. We were in a physical valley on that baby-soft turf, but the PAX locked shields, looked out for each other, and put in some serious work. YHC loves working out with Billy Blanks, who is always encouraging the PAX to keep pushing. Slicnut provided some Moneyball-esque midwife noises, but it wasn’t the same. We need to find him and apply a firm EH. While yogging backwards, gazing dreamily at the pink and orange, cloud-speckled sky, Gus lamented that such sights cannot be seen inside an iron tribe, whatever that is. Captain Obvious didn’t show, so YHC had to settle for water afterwards. Tragic. GrowRuck – Cannot recommend this event more highly. Sign up if you care about accelerating. Previous PostPrevious Start a Fire!